Memorizing your presentation will help make it go smoothly (and you feel less nervous), right? Probably not, according to Toastmasters International experts on public speaking. 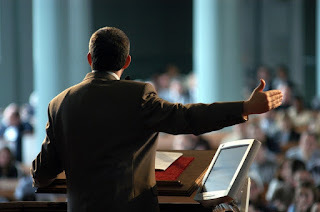 Many people think memorizing their speeches will ensure success, but “it’s a terrible idea,” says Dr. Genard,author of “Fearless Speaking.” Reciting a speech from memory gives it a canned quality and distances a speaker from listeners. Also, a speaker who forgets one section might lose track of what follows, “and suddenly you’re at sea,” he says. A better approach is to plan a beginning and ending, then hold in mind the main points to make in between, says Gary Schmidt, Oregon City, Ore., past president and spokesman for Toastmasters International. If you do forget what you planned to say, The Wall Street Journal suggests pausing to take a deep breath or taking a sip of water so you can remember those main points. Check out the article below for more tips on getting your speech back on track.